Carded samples can come in a variety of styles. The figures can be painted hardcopies, protomolded figures, first shots, or production figures. The card backs can be sample cards, proof cards, or production cards. Finally, the bubbles can be hand cut or production quality and can be applied by hand with glue or double sided tape or applied by machine. These samples would mainly be used for presentation internally, as salesman samples, or for photographic purposes. In other words provenance is key when dealing with carded samples. With so much variety involved a collector must make sure their source is rock solid. 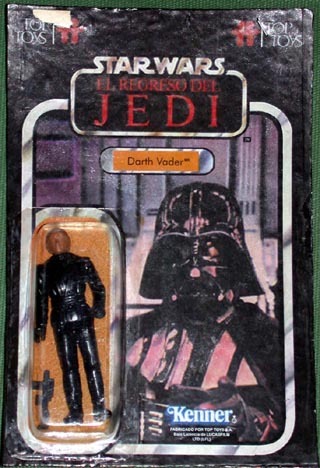 Featured is a Top Toys carded first shot of Luke Jedi on a Vader card. 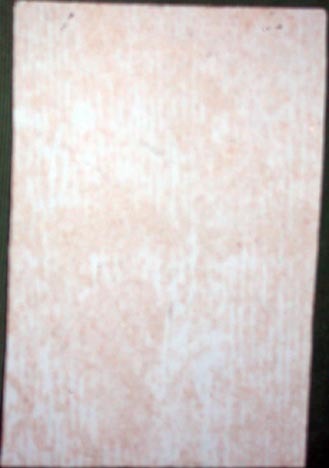 The card is square cut, with two staples on the top of the card, and has a bit of paper left attached to the left staple. My best guess would be that sign off sheet had been attached at one time, similar to US carded signed samples. The figure is totally unpainted, and comes with a Stormtrooper weapon. The material of the card looks to be just cardboard, with the Vader image adhered on. The back is completely blank This helps support my earlier theory that Top Toys would run off comp sheets and just glue them to whatever they needed at the time. This is a great close-up shot of the figure. The final shot is a side by side comparison of final production figure (left) and the carded sample (right). Foreign to the US prototype material is few and far between but thanks to the diligence of collector Matt Brand this stash of Top Toys prototypes was unearthed. In this stash are a Top Toys presentation board, an unproduced Lando Calrissian (Skiff Guard Disguise) hardcopy , and a Top Toys licensing sheet. Subsequently, Matt's source opted to offer some more prototypes on a popular auction site through two seperate brokers. 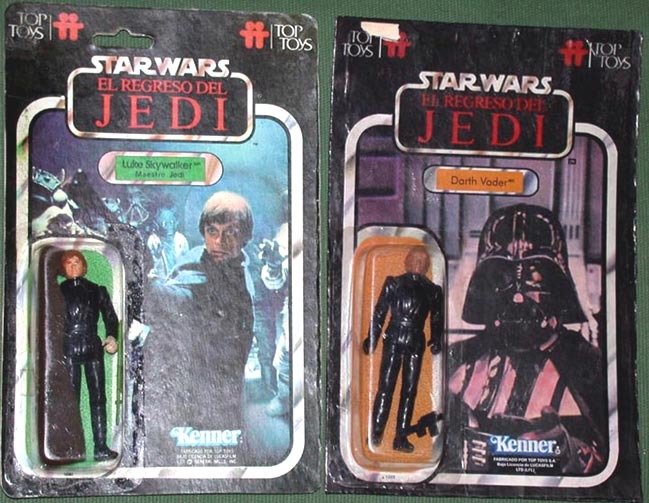 Among these other protypes were carded samples for Luke Skywalker (Maestro Jedi), Stormtrooper, Chief Chirpa (Osito Ewok), and Darth Vader, as well as laser copies of an additional unmarked proof or comp sheet.